Dark Passage (2009) embodies the many sides of London, Ontario-based artist Roly Fenwick. With its barely discernible forms and expressive brushwork, it could be read as a literal manifestation of a dark passage—whether that be at sea, on land, through hallways, or down urban alleys. As viewers struggle to make sense of the painted forms, they may experience a moment of recognition. This is what the human eye “sees” when it cannot. 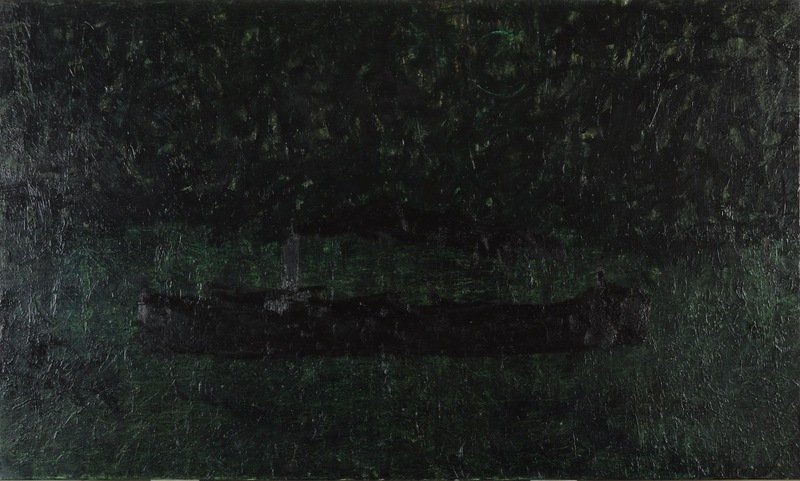 If read this way, Dark Passage can be interpreted as an extension of Fenwick’s considerable body of landscape painting and inventive depictions of natural phenomena (for years he has painted the swamps, forests and rocky crags of the Bruce Peninsula region where he grew up). At the same time, the painting contains the potential for humour and a kind of “trompe l’oeil” trickery that characterizes his surrealist-inspired works of the 1970s. With figures literally climbing into other dimensions beyond and behind the picture plane, these earlier works showed Fenwick’s ability to be playful with notions of perception, and to call into question traditional roles of artist, subject and viewer. Of his landscape paintings, Fenwick has said his “interest is not in scenery but in probing to reveal the forces beneath the veneer.”1 In Dark Passage, he destabilizes his work and his viewers by “revealing” something that cannot easily be seen, let alone understood. 1. quoted in Bio, Roly Fenwick. Michael Gibson Gallery website. http://www.gibsongallery.co/artists/roly-fenwick/bio.